Resonate’s Central Dispatch virtual Load Balancer (CDvLB) provides traffic management capabilities that ensure dependable performance and responsiveness for improving for application delivery with CDvLB deployment in proxy and native modes. CDvLB helps businesses meet the challenges of assuring a positive and productive remote user experience, by satisfying both end-user and IT personnel expectations with high availability and high performance traffic management. So the need for CDvLB offers performance benefits while reducing the amount of servers needed. Resonate CDvLB is deployed within a virtual environment to allocate multiple server resources, and efficiently load balance traffic among servers to accelerate responses to users downloading applications and requesting content. 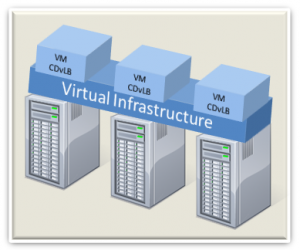 CDvLB supports VMware virtual platforms. For example, within VMware’s infrastructure API, CDvLB collects real-time information such as CPU, memory and traffic load, and combines this data with network performance statistics to intelligently manage traffic among the server pool. CDvLB works with the VMware Distributed Resource Scheduler (DRS) and Vmotion, allowing administrators to configure triggers to start, shut down, or move virtual servers based on network performance metrics that are not monitored by VMware. When used with DRS, CDvLB can trigger VMware to initiate additional server resources when they are needed. When traffic decreases, CDvLB can trigger VMware to turn those server resources off. Administrators can also use custom scripts. For example, if CDvLB discovers a virtual server failure, a standby server can be activated, and then the script can restart the failed server. As the number of servers increase, so does the management. Unfortunately, when using virtualization technologies, companies still deal with manual configurations and changes as they monitor and maintain systems to ensure optimal availability and performance. Resonate’s CDvLB monitors server health and performance, while automating the distribution of server resources, thus minimizing manual intervention.